This new condo development is a pre-construction condominium by Tridel and will be the third tower in the West Village master-planned community. 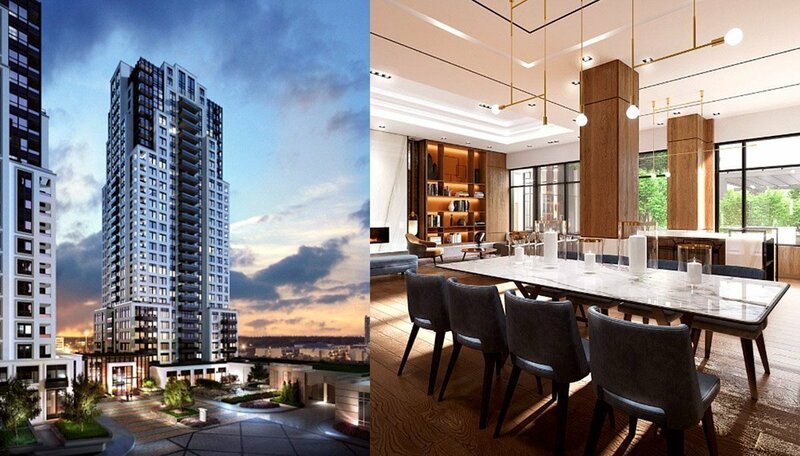 Evermore At West Village is launching soon in Etobicoke’s West Mall neighbourhood. With modern, energy-efficient features, plenty of greenspace and a detailed roster of amenities, the latest tower in this community is sure to be a showstopper. The tentative occupancy date is 2022. This condominium in Etobicoke sits on Eva Road, near The West Mall and Bloor Street West. Designed by Kirkor Architects and standing 28 storeys, the tower is expected to house 204 units. Floor plans will consist of two-bedroom suites ranging from 778 to 1,117 square feet, three-bedroom suites ranging from 987 to 1,228 square feet and the Terrace Collection ranging from 778 to 1,228 square feet. Like many Tridel buildings, the features and finishes in this development’s other towers are high-quality, modern and energy-efficient. Kitchens come with ENERGY STAR appliances, stainless steel, ledge-back sinks and durable granite countertops. In the bathrooms you’ll find low-flush toilets and designer vanities, while premium laminate flooring with acoustic underlay and expansive windows make suites as beautiful as they are functional. At Evermore At West Village, enjoy access to the “club,” an elegant amenity hub that features a comfortable fireside lounge, fully-equipped gym, an indoor swimming pool and a sleek party room with a wet bar. A rooftop oasis with barbecue stations and dining alcoves is the perfect place to unwind on a summer night. Large suite layouts appeal to growing families and Tridel has also incorporated amenity spaces to accommodate the younger family members. 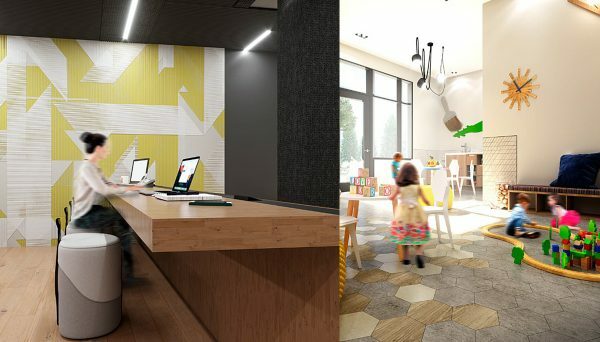 The Children’s Play Room and Arts & Craft Area will be a colourful environment that will surely keep the little-ones busy. The Youth Zone is the ideal place to foster new friendships and create new things in the Music Room, Zone-Out Lounge or Media Break-Out Centre. In its entirety, the master-planned community will feature four towers arranged around a large greenspace, as well as a comprehensive pedestrian network. Located in the heart of Etobicoke, this new condo is a short drive down the 427 to the newly-upgraded Sherway Gardens mall, which features 215 retailers and restaurants, including Saks Fifth Avenue, Coach, Hudson’s Bay and the Keg. Your daily needs are easy to get to, thanks to excellent highway access and a comprehensive public transit network. Highway 427 and the Gardiner Expressway are just minutes away, making it a breeze to commute, whether you’re heading elsewhere in the neighbourhood or to another part of the GTA. Need a nature fix? Head to Etobicoke Creek with its lush, surrounding parkland or to Islington Golf Club for a relaxing afternoon on the course. Meet your friends at the neighbourhood pub, catch a movie on the big screen, get in an early morning jog along one of the region’s many trails or head over to one of the neighbourhood’s many recreation centers. Etobicoke is also a major commercial hub, ranking as Canada’s fourth-largest corporate head office center. Additionally, it’s recently been announced that Toronto’s film production industry will be expanding to the suburb, with two new studios in the works that are expected to total 50,000 square-feet and add a significant amount of jobs to the area. Come see why investors are banking on this west-end suburb as one of the GTA’s next hotspots. 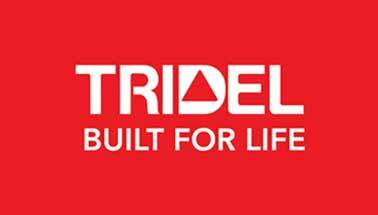 Tridel is easily one of the GTA’s most established development firms, having been in business since the 1960’s. Some of their earliest luxury apartment complexes are credited as serving as a blueprint for the concept of modern condominium living. Not only are they known for the quality of their buildings and suite finishes, but they’ve managed to snag BILD GTA’s “Green Builder of the Year” on eight separate occasions, an unprecedented achievement.